Newby Management began serving the manufactured housing industry in 1975. Founded by Martin Newby, the company was established with a commitment to excellence and family values. Trustworthiness, honesty, integrity, and the importance of relationships were standards of the daily operation. These, combined with a hands-on approach provided a solid platform on which the company would grow. This statement serves as the yard stick by which the Newby team operates. Other values have become linchpins in the company’s daily operations, such as a teachable spirit, servant’s hearts and families first. The people-centric values created unique programs that separated Newby Management from its competitors. A program titled Insight TRACK ® was created to survey the satisfaction of our resident customers. This tool was ultimately integrated into the National Manufactured Housing Association as their method of evaluating how other operators were serving their residents. A dedication to service and excellence permeates the organization. It’s common for employees to go above and beyond in service and expectations. The Newby Management Emergency Action Team (NEAT) is a primary example of the high-quality service the team employs. 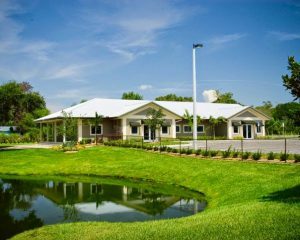 In August 2004, Hurricane Charley ripped through Southwest Florida and damaged a Newby Management community. From that experience, NEAT was created to respond to disasters that may occur in Newby communities. These disasters include hurricanes, fires, tornadoes, flooding and terrorism. This is merely one fine example of how the team saw a need and rose to meet it in their communities. Still, the most unique aspect of Newby Management is the day-to-day commitment of the team. Each day the company begins with prayer. This simple act grounds and unifies a team of individuals coming from a diverse set of backgrounds and struggles. By walking through life together, the team can often be found helping one another both inside and outside the workplace. The one for all mentality creates in the team a bond that cannot be broken by the rigors of work. The company’s statement of purpose means different things to different people, but one thing remains constant. Each person has a servant’s heart that is at the core of who they are. It’s this mindset that makes customer service at Newby Management so unique. Whether it’s a resident, an investor or a vendor, each team member takes personal responsibility for the customer service someone receives at the company. If you call the office you’ll likely be greeted with “Thanks for calling Newby Management, how may I serve you?” It’s a simple phrase, but one that sets the tone for the entire conversation. An inimitable team such as this is not born, but rather it is carefully built. Each team member is carefully selected for their position based on a number of criteria including both character and competency. With the right people working in the right places, Newby Management has the depth to offer a vast array of services to clients, which sets them apart from competitors in the industry. The Newby Management team knows that each property faces unique challenges. That’s why each property is approached individually, and their struggles, hopes and dreams become Newby Management’s. Each property is handled as if it belonged to the company. Accounting is usually marked by numbers and figures. At Newby Management, it’s marked by genuine care. The accountants treat all the money they handle as if it were their own. They personally invest in the outcome of the finances, and through it are able to provide excellent customer service and financial reporting. When investors or ownership groups make special requests known, the accounting team meets them consistently. The company’s service package is often customized to meet the needs of a variety of challenges that investors and owners face. Unlike other companies, Newby Management clients have the comfort of knowing they will always be able to talk directly to a live person who handles their account on a day-to-day basis. Hiring the right team members for the right positions is about more than wordy job descriptions. The human resources department at Newby Management is dedicated to finding the right team members, with the right personalities to fill positions on our team. The Newby Management IT team is on the cutting-edge of technological advances in the industry. A thoughtful, intelligent group of early adopters make this department unequivocally trained to handle a vast range of requests, issues and ideas in the property management arena. In an ever-evolving digital landscape, the sales and marketing team at Newby Management works to stay current across all mediums. The in-house talent available to clients is unparalleled in the industry, and gives the team a unique ability to create one-of-a-kind products and marketing programs that are tailored to individual communities. Our fast-paced society often neglects the emotional and spiritual needs of people. Our chaplaincy program is designed to connect with people on a deeper level, giving them a touch of humanity that is often lacking in the workplace.